Water Popping, also sometimes called, “grain popping” is a process used to open the grain of the wood flooring so that it will accept stain more ready and evenly during hard wood floor restorations. Before attempting to use a water popping technique on a wood floor, do a test on a sample board. The key to successful water popping is controlling the amount of water applied to the wood and the amount of time the wood needs tom dry before applying the stain. The professional doing the job should measure the moisture content before water popping to establish the baseline moisture content, and then test to see how long it takes for the wood to return to its original moisture content. The affect of water popping will vary, depending on the amount of water used, the length of time it’s allowed to dry, the species of wood, and the type and color of the stain that will be applied. It is important to record the moisture content of the wood flooring before water popping. The wood must be allowed to dry completely and the flooring must return to the normal moisture content before proceeding to the application of the finish. When bleaching your hard wood floors you will want to aggressively ventilate the room with open windows and fans and be sure to wear approved respirators. Bleaching wood flooring retains the general tone and reduces variations in color without obscuring the floors grain patterns. 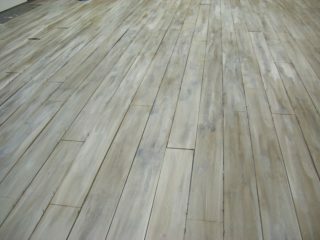 Bleaching also tends to soften the surface fibers of the wood. Understand that bleaching your wood floor will change the color of the wood itself. This will not make the floor white. Red oak will lighten to a pink cast and white oak will have a greenish cast. Make sure that the floor is clean and free from oils, grease and old finish first. Bleach may be caustic and can cause burns. Therefore safety glasses and gloves are highly recommended when bleaching. Bleaching will also cause the grain of the wood to raise. Sanding with fine paper or buffing may be necessary after bleaching to restore a smooth finish but you should always refer to the manufacturers recommendations. Most wood fibers cannot be bleached. Make sure that you use bleach that is recommended for wood. Then make sure you follow the bleach manufacturers recommendations because some bleach may need to be neutralized first. It is highly recommended that you do a test in an inconspicuous place or on a test panel. This is because the length of time the bleach remains on the floor, will affect the color removal. Do not do multiple applications. Subsequent applications actually soften the wood and make it prone to denting. 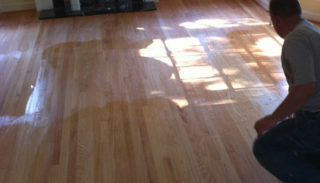 A stain may be applied before the finish in a hard wood floor restoration. And, always use non-ambering finishes with bleached white floors and pastels.